Rescue Squad 1756 is a 2011 Pierce Velocity. Heavy Rescue 1756 responds to all structure fires, vehicle extrications, and other hazardous responses in Mehlville Fire Protection District. The Rescue Squad is the main unit that responds to high angle rescue or below ground or trench rescue when persons are trapped. Specially trained firefighters will utilize the Squad's equipment and tools designed to carry out the extraordinary type of rescues. For example, utilizing equipment and tools on the Squad, firefighters are able to rescue persons underground in a confined space, high on a bluff or trapped in machinery whether it might be heavy industrial or a printing press. The Squad also responds to water rescues. The Squad is equipped with air bags that are designed to lift hundreds of tons of weight. High pressure air is forced into specially designed bags that are strategically placed under the item needing to be lifted. The bags then are filled with air and the bags then actually do the lifting. The Squad has a strut lifting system that is designed to lift a tractor trailer off of another vehicle. In the event that steel needs to be cut, the Squad carries a plasma torch that will cut up to 5/8" steel. 1756 also carries advanced life support emergency medical equipment including an automatic external defibrillator. The Squad is also utilized, as available, for any heavy rescue situation in the St. Louis Metropolitan Area. 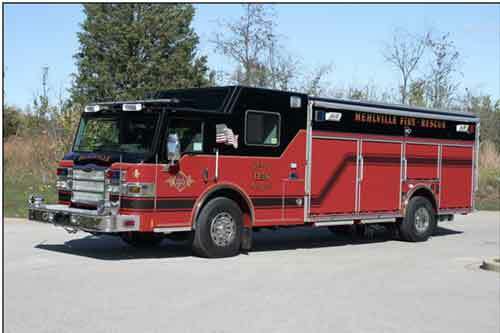 Rescue Squad 1756 is powered by a Cummins ISL motor rated at 425 horsepower with an Allison 3000 EVS automatic transmission. This unit was an add-on to an order Pierce built for the United States Navy. It features an oversized rear cab that is set up as a command module for large-extended incidents. Rescue 1756 carries a vast array of specialized tools and equipment used in unique rescue situations including two complete sets of Genesis hydraulic extrication equipment. It has a 12,000 pound winch in the front bumper extension as well as a 9,000 pound portable winch that can be placed in any of the receivers on the sides and rear of the unit. For the purpose of refilling SCBA cylinders on emergency scenes, the unit has an 8-bottle 6,000 psi air cascade. The air cascade also supplies two hose reels, one high pressure and one low pressure, for air tools. An Onan 30kW PTO-driven generator provides power to a Will-Burt Night Scan 15-foot light tower with six 1500-watt lights.